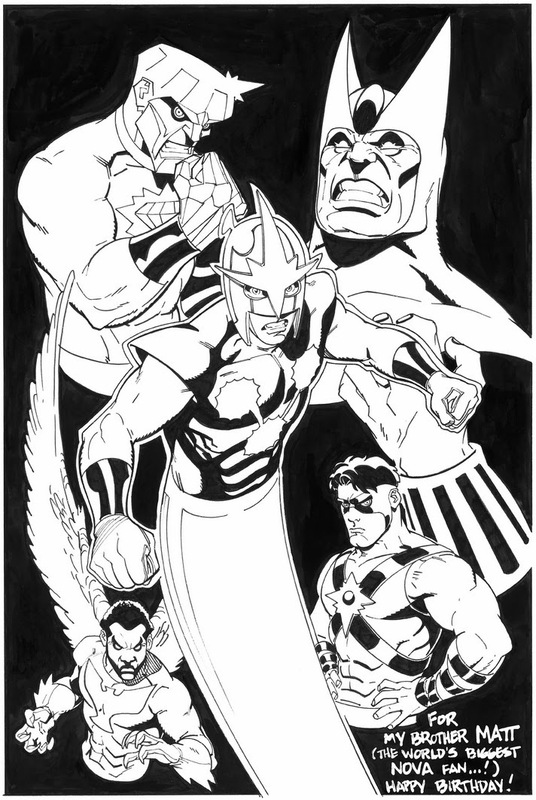 These are Random Works of Wow (now on Wednesdays) and illustrating the point this week is the late Mike Wieringo, with a pin-up done of Nova - The Human Rocket, for the birthday of his brother Matt "The world's biggest Nova fan". Timely, because New Year's Day is often spent with family, be they family by blood or family by bond, and this piece beautifully underscores their importance. Condor, Diamondhead, The Sphinx and Powerhouse, there was something a bit kooky with all the original Nova foes, but that was the way with those of a certain Web-slinger too. Like his pencils often had a way of doing, Mike renders them all on the same level, making you wish he could've gotten his hands on the high-flying hero for real, while he was still at this early stage of his career! I mentioned once to other FF fans how I disliked Wieiringo's work on te FF book because he made them look too cartoonish, almost Simpsons' like. To my surprise they agreed! I did like his work but felt at times it was a tad goofy. The vast majority of FF fans thought his Doom arc 'Unthinkable' could've been improved so much if he hadn't drawn it as it was so much a scary story. Still ,he had his loyal fans who miss his art ad for bold splash pages he certainly knew how to make an impact. Yeah, Unthinkable was pretty dark for a Wieringo story - considering what Doom made his armour from especially - but the fluid way he captured Mr Fantastic was stunning. The guy has never seemed more elastic. He wasn't the first artist I'd turn to for a Fantastic Four run, but he did prove there is life in the traditional FF costumes yet and anyone who sticks to Kirby can never be too far off base, esp on this book to me.